No word on the launch date (though apparently is it’s due out early next year) or price point, but with the highest eco-credentials of any new phone we’ve seen actually coming to market, could this become the Prius of the phone world? Socialight, the location-based community platform that delivers user-generated information through geo-tagged ‘sticky notes’, have just launched a location-aware search service for London, offering hyper-local, custom-filtered content on your phone. The site is currently in Beta for the UK so, for PSFK, I caught up with Simon Davis and David Belnick from their London team to find out more about the state of the location-based services market that they’ve just entered. Everyone’s been talking about location-based social networking services, how do you see this working for the future? Location-based services got a very bad name with the initial offerings, what you would get wasn’t worth it. Everyone’s wanted it but it’s never been delivered. But tons of people have got great location-based content, it’s just very difficult for those people to know how to develop a mobile service to put it on their phones. With Socialight we can go to companies like Time Out and offer them another channel for communication. The idea of Socialight is that it offers different types of content for different types of people broken up by the channels, and through either bookmarking it or texting specific words to the short code it will pull you in to different kinds of content. To us, the user-generated aspect is very important in terms of having people interact with the service and improve the quality of the data, but we have also built up some channels through buying in and commissioning content, in particular Late Night London which is loaded with opinionated content created by musicians, DJs, artists and people who are out late! We’ve tried to make this an open platform so that anyone with appropriate content can also create these kinds of services. As well as the usual networking comments and tags, we envisage you creating lots of little communities around specific types of location-based content. As the channels grow there’s the possibility of collaboration and communication with those that are all interested in the same thing within that channel, plus there’s the ability for whoever created the channel to then communicate with them. It’s a way of creating communities around people’s content and existing content. It is community created, but it’s not community for community’s sake. But then what we would do is use those services to continue running services that are free like the general Socialight social networking service or niche services like Late Night London, stuff that’s interesting and edgy and exciting, but also social. So we think there’s going to be a mix of paid services and free services. That was the reason we built this open platform with channel capability. Our preferred model is obviously advertising supported. We think mobile services will go the same way as the online model; free services ad-supported, it’s just what to do in the interim process. How far do you feel the advertising industry is from utilizing these mobile opportunities? The problem with WAP ads is that they are in their infancy. Although they’re growing exponentially, the pool of advertisers is currently limited to ringtones, wallpapers or services that can run on a handset. What we want is for the ads to be part of the service, relevant to the location-based services, when this happens an ad-supported model is definitely going to work across all these services, but we’re not there yet. Currently there’s nothing stopping someone going into Socialight, creating a note on their business and offering a special offer/ advert that it will serve as a piece of content, as a sticky note. People already do this, but in terms of serving ads, the big companies don’t provide any mechanism for say Joe’s Café to place an ad that’s going to be delivered to a mobile user around them, the targeting is just not there, they can only send it to a particular handset or country. The current ad networks aren’t geared to support these services with ads, but we’re thinking about that too, we’re building our ad service that is specifically geared to these types of services. Within Socialight you can also have any channel you want and attach any value to that channel in terms of sponsorship, branding and specific demographic. Because if the content is valuable the people will consume it, and sometimes even be willing to pay for it. How do you find the state of location-based services in Europe versus the U.S? The UK the market is much more mature for this. Here it’s quite easy to launch a service with a call-to-action that involves a short code, everyone’s used to that. In the U.S you often can’t get a cross-carrier short-code because there are so many carriers. There is no aggregation in the US so location-based services don’t work. Plus there’s a huge installed GPS handset base in the US, about 50% of the handsets there have GPS chips, so we think there you’re likely to see the take-off of java application with GPS rather than any network location stuff. This UK model however transports very well to Europe, to South Africa, and to most of Asia. Socialight already handles content created in all different languages, we’ve made sure it supports all the correct character sets so you can get notes right now in Italian, German, even Korean. The underlying technology in Europe is the same as here so with the right partners we could definitely move into different territories, but right now we’re focussed on the UK. A mobile phone and web-based gaming activity that embeds physics learning into the core of its application, Newtoon is a collaborative project between UK-based Futurelab and Soda Creative that is designed to encourage children to create, play, edit and share micro-games based on Newton’s laws of physics. A science teacher is anxious about KS3 Unit 8J: Magnets and electromagnets. She wonders how she can excite her pupils about the world of magnetism. The teacher launches Newtoon on the whiteboard and searches for a tutorial on ‘magnets’. She opens a research microlab and by moving and rotating the bar magnet, she demonstrates that the ferrous bar always attracts while the bar magnet both attracts and repels depending on polarity. On their desktops, the pupils then select ‘dog’s dinner’, a micro-game which explores magnets. Racing against the clock, the pupils steer a dog towards the bone, avoiding the magnetic forces. Having been prototype tested in schools around the UK already this year, and with trails due to launch any day now, this is an exciting new system for the future of learning that may finally begin to bring about the materialisation of the much-deliberated re-think to the tenets of teaching. Christopher Enright, chief technology officer for digital design company IconNicholson, said putting these mirrors outside store fitting rooms meant women could go shopping with their friends — remotely. 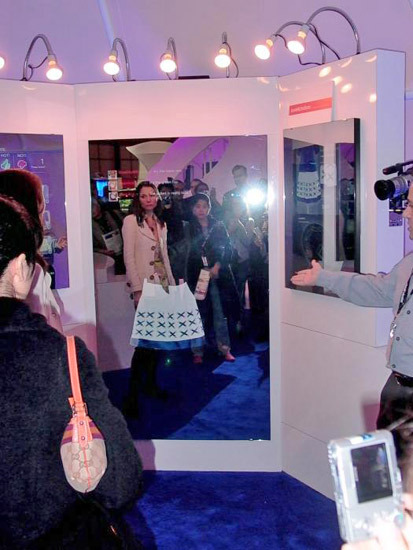 “She could be in Paris, your mom, watching you try on your wedding dress (while you are in New York),” Enright told Reuters on Tuesday as he unveiled the interactive mirror at a retail trade show. Using the interactive mirror, a shopper’s friends can then text message back with comments about the outfit.